Update: Word has come via #SaveLICH that SUNY is now removing all patients from LICH and intends to padlock the hospital over the weekend. Protesters have gathered at Hicks and Pacific; Bill de Blasio and Steve Levin are there. The SUNY Downstate website now includes a summary of the seven suitors’ proposals for Long Island College Hospital. The identities of the suitors are not disclosed. The first proposal contemplates keeping LICH a full service hospital, but operating it on a for-profit basis. It is contingent on state approval of such a change. The second would sell off (unspecified) “non-core properties” to real estate developers, with SUNY continuing to provide (unspecified) “health care services” in the “core properties.” The third is from a provider of outpatient services, and offers two options. The first is to dispose of inpatient services at LICH, transferring them to to other Brooklyn hospitals, and to provide outpatient services, “including primary and specialty care, emergency department and ambulance services, ambulatory surgery, rehabilitation therapy, mental health services and prenatal and family planning” at LICH. 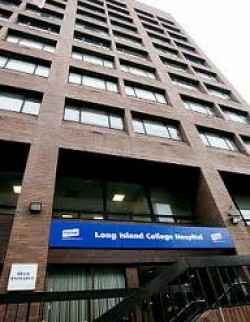 The second, if retaining inpatient services at LICH is required, would be “for [a] medical home visitation service to supplement such inpatient services as their outpatient arm, providing full home-care and outpatient services, along with any outpatient and caregiver educational components.” This could only be done in conjunction with some other entity operating the inpatient services at LICH. The fourth proposal would convert two floors of the Fuller Pavilion into a long-term health care facility, presumably disposing of the remainder of LICH for development. The fifth would also see most of LICH going to developers, but would “provide ambulatory care through an extension of an existing federally qualified health center (FQHC), and radiology and ancillary services under an existing Article 28 licenses [sic], all in a health care center in the 349 Henry Street building.” This proposal is contingent on various conditions being met, including “support for operating losses in the first two years of operations” and waivers of or changes in certain state regulations. The sixth envisions the creation of an as yet unspecified “coalition” which “at minimum” would “include a real estate consortium, a not-for-profit hospital operator and strategic, operational, financial and clinical consultants.” This would provide for a sale of LICH properties “to a real estate coalition with lease to the hospital operator with buyback provision” and operation of LICH in accordance with “a not-for-profit public/private partnership, physician led primary care model.” The seventh is a proposal to take over management of LICH, with no further details provided. Of these proposals, only the first and sixth, and the second option under the third, clearly contemplate keeping LICH as a full service hospital. The second and seventh may. The others–the fourth, fifth, and first option under the third–would radically downsize LICH, selling off most of the properties for development and keeping a token health care facility in place.